Most of us don’t know what happens to our recycling after we take it to the curb each week. On Feb. 2, hundreds of recycling workers and community supporters gathered in Oakland, Calif., at the Recycling Workers Convention to discuss a wide range of serious problems plaguing Alameda County’s recycling industry with an audience of elected officials and policy makers who oversee this supposedly “green” industry. An alarming number of injuries to recycling workers: The dirty and dangerous job of sorting and recovering recycled materials in Alameda County is performed by a mostly immigrant and largely female workforce. The workers are exposed to a host of dangers, including contaminated hypodermic syringes, animal carcasses and feces, heavy dust and a host of sharp objects that cause injuries. On June 19, 2012, a waste worker in another part of the Davis Street facility was crushed to death-caused by Waste Management’s failure to follow safety laws, according to the Division of Occupational Safety and Health that fined the company more than $50,000 and issued two “serious” citations for ignoring the law. The company is refusing to pay the fines and is trying to appeal the citations. Rat infestations: Recycling workers at Waste Management’s Davis Street facility were plagued with an infestation of rats that management ignored until workers took action. The rodents carry a host of serious diseases, and employees were forced to work in close proximity to the rats, rat feces and urine. The problem was finally addressed-but only after workers organized themselves and protested the dangerous and unlawful exposures that were ignored by Waste Management officials. Low pay that requires employees to work full-time for poverty-level wages: East Bay recycling workers earn 40% less than the same jobs pay in San Francisco and San Jose. 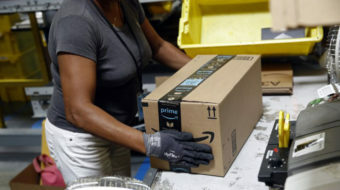 The low pay forces some workers to seek public assistance and many others to work six-day weeks in order to supplement their incomes with weekend overtime pay. Some work schedules that begin in the morning at 3 or 4 are already stressful on family life, and the added hours place a heavy toll on family members. Illegal retaliation against predominantly immigrant workers: After workers at Waste Management prepared to protest unlawful labor practices by their employer, the company retaliated by subjecting some workers to an E-verify background check of their immigration status, resulting in several workers losing their jobs and generating a climate of fear and intimidation. Waste Management’s actions were prohibited by the union contract, which the company violated. It’s also a violation of federal law for companies to retaliate against workers who organize together and take action to stand up for their rights, as happened in this case. The workers dismissed by the company were not new employees but had been working for Waste Management from one year to 18 months. Action plans: Those attending the Recycling Workers Convention adopted a platform calling for uniform standards to improving working conditions in the industry-and improve recycling services for Alameda County residents. A dinner was served at the conclusion of the convention, allowing families to share a meal with co-workers from four major recycling employers in the region and discuss plans for the future. Oakland Mayor Jean Quan met with families during the dinner and signed a support statement to help them improve conditions and improve services to local residents. Sustainable recycling campaign: The joint work by community supporters and recycling workers has generated a new organization called the Sustainable Recycling Campaign. 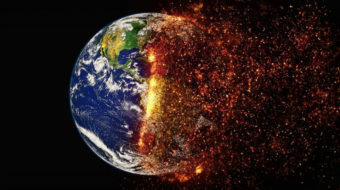 The organization unites environmental, worker and community concerns into a powerful effort that is fighting for better working conditions, improved serves and environmental benefits. The effort already has attracted key organizational support from local and national groups, including: the California Immigration Policy Center, Center for Environmental Health, Communities for a Better Environment, East Bay Alliance for a Sustainable Economy, Global Alliance for Incinerator Alternatives, Green For All, Interfaith Committee for Worker Justice, Martin Luther King Jr., Freedom Center, Sierra Club, WORKSAFE and others. City Council testimony: Three days after the Recycling Workers Convention, a delegation of 46 recycling workers and community supporters attended an Oakland City Council meeting on Feb. 5. Recycling workers and a host of Oakland-based organizations testified at the council meeting about Waste Management’s retaliation against immigrant workers. Supporters carried signs and wore stickers that read: “Oakland is not Arizona-we respect immigrant rights!” Council members are now scheduling follow-up meetings with workers and supporters in the coming weeks to get more details. Community outreach and coordination with local elected officials is getting an important assist from the AFL-CIO’s Kevin Christensen. Company pressure: Waste Management scheduled mandatory workplace meetings with employees the morning after the workers’ delegation testified at the City Council meeting. The company’s effort to threaten and intimidate workers hasn’t been getting much traction since 21 workers from four recycling firms recently attended a special “Organizing Institute” training- taught entirely in Spanish and organized by AFL-CIO Organizing Department staff, led by Gaspar Verdugo. The training emphasized leadership skills and techniques to involve co-workers. The training ended with workers taking assignments to network with co-workers, motivate attendance at the convention and other tasks. 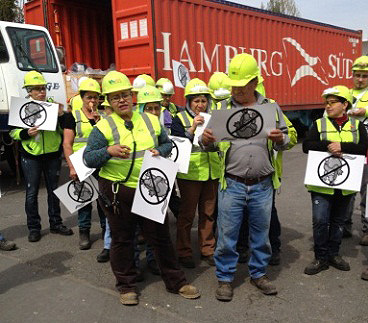 “The training results were immediate and impressive,” said ILWU organizer Agustin Ramirez, who is helping the recycling workers pursue their campaign for justice.